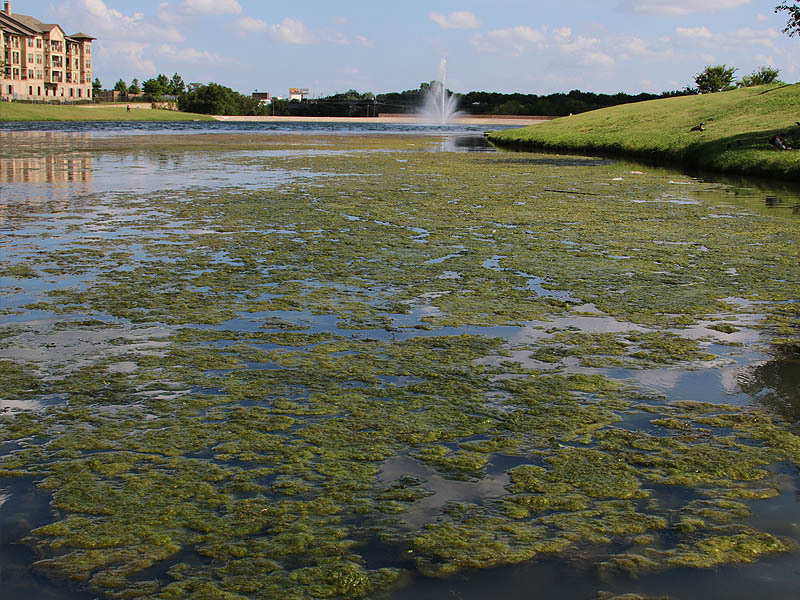 Long hot Texas summers can take a toll on ponds and lakes in the Dallas/Fort Worth area. Water that appears clear and pure in the winter and spring can become dirty and smelly under the relentless heat of the summer sun. Even here at Josey Ranch Lake algae blooms pushed by strong winds are forming mats in the shallow water areas. This will likely turn ugly when the heat becomes oppressive later in the summer. 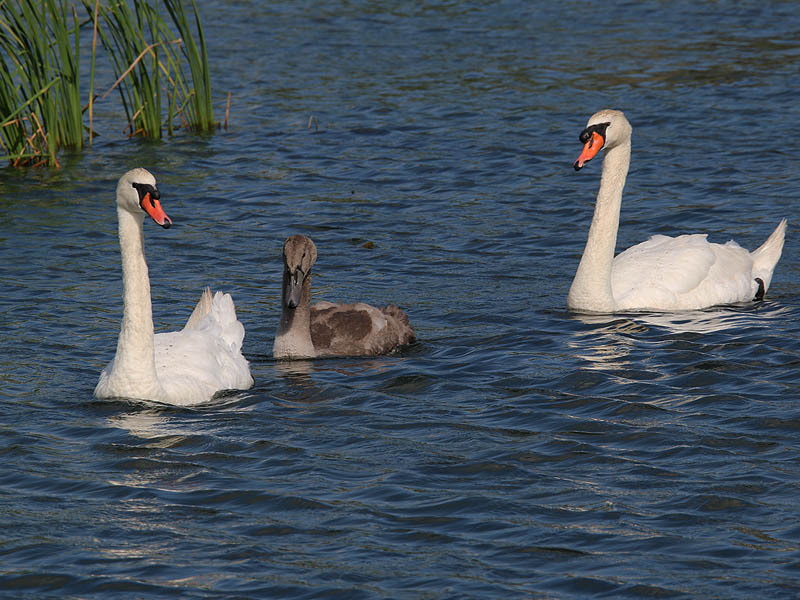 I have been observing this family of Mute Swans for roughly 14 weeks now. 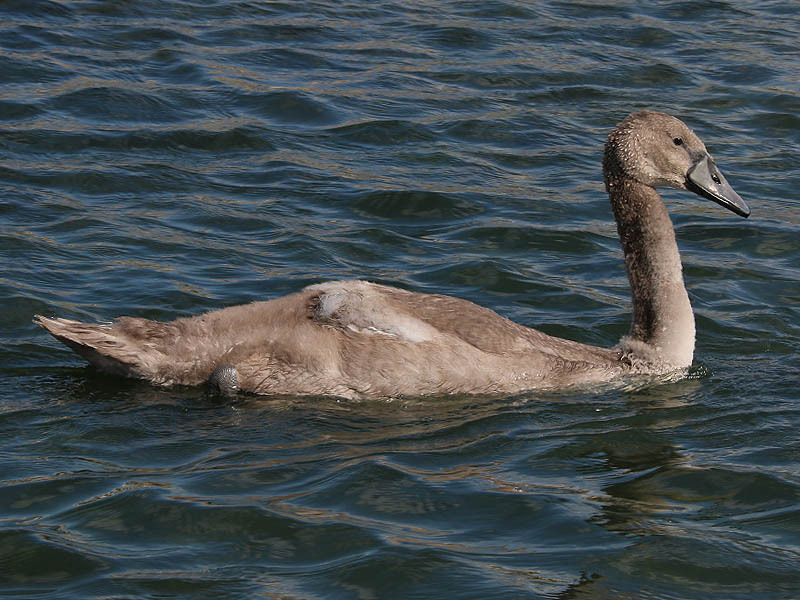 I cannot tell you what a pleasure it has been to watch this little cygnet grow over the last several months. 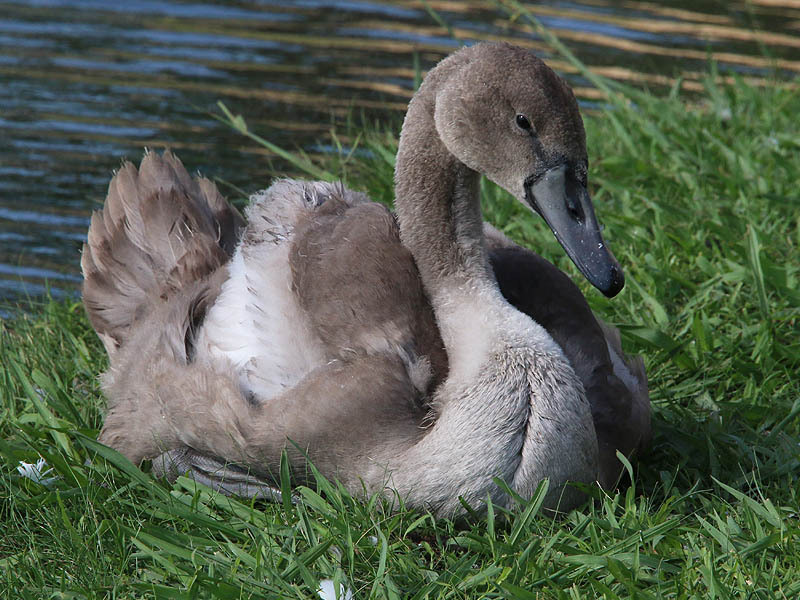 The juvenile is right around ten weeks of age now. His feathers are coming in and his appearance changes significantly from week to week. He is nearly as large as his mother now, and seems to be carrying himself with much more confidence of late. It should be very interesting to watch this young bird as he transitions into the fledgling stage of his life in the coming weeks. 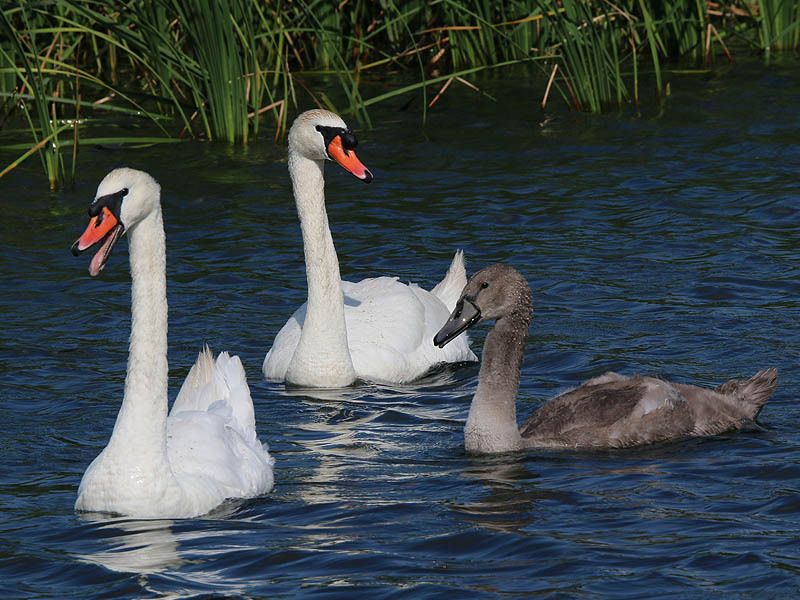 The Mute Swan family at week 14. Together on the beautiful blue water. 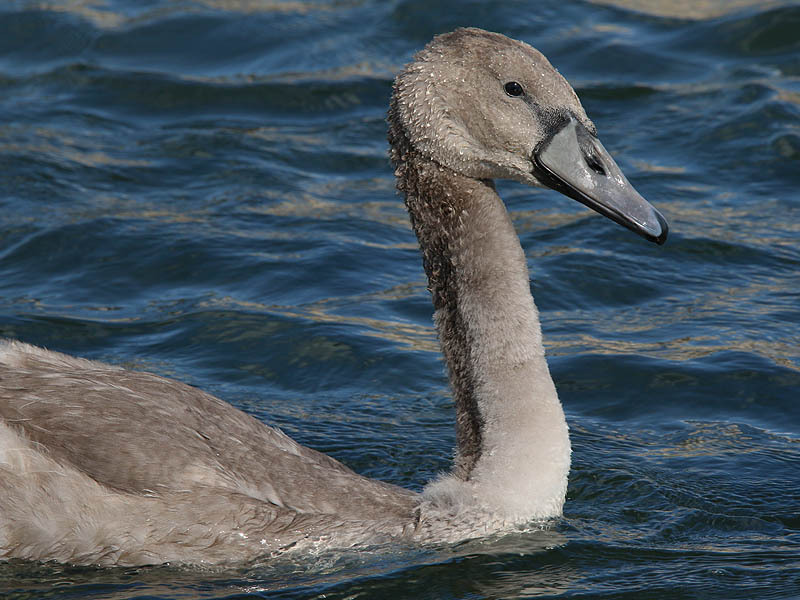 A closeup of the Mute Swan cygnet. 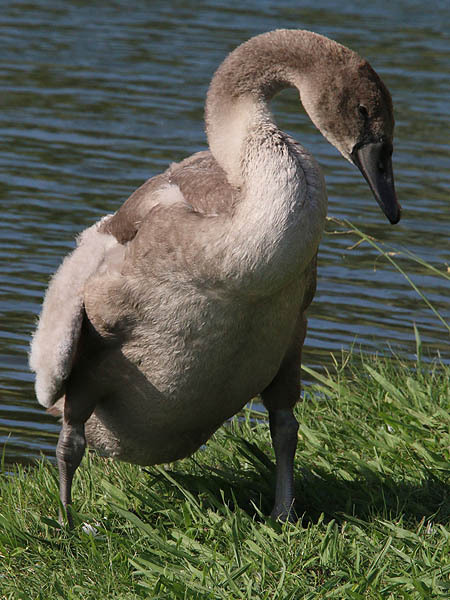 The cygnet at 10 weeks of age. 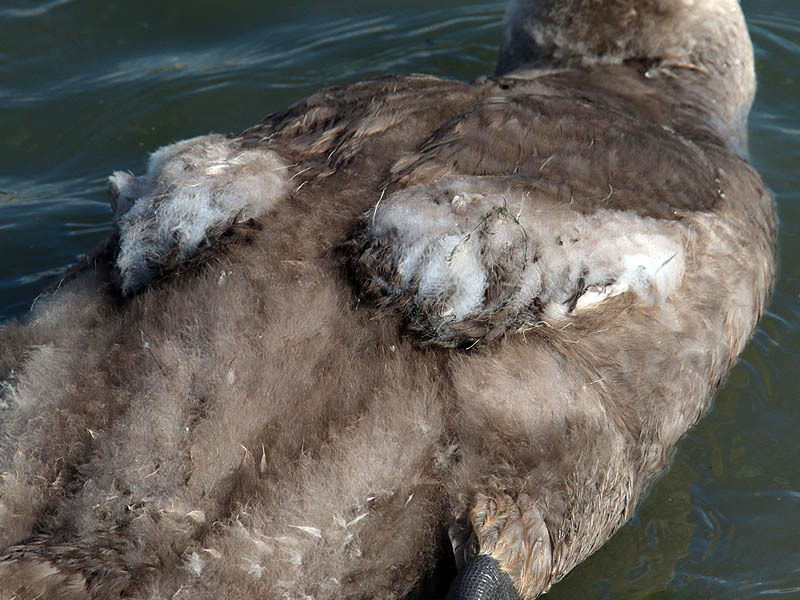 Feathers are replaceing the fluffy down of youth. His tail feathers are progressing nicely. 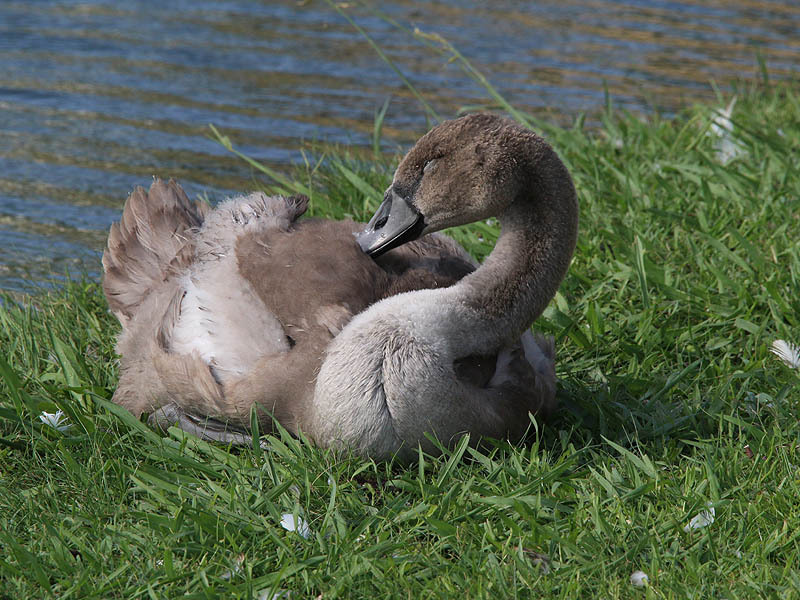 It won’t be long before the cygnet is as large as his mother. Coming out of the water to relax in the sun. 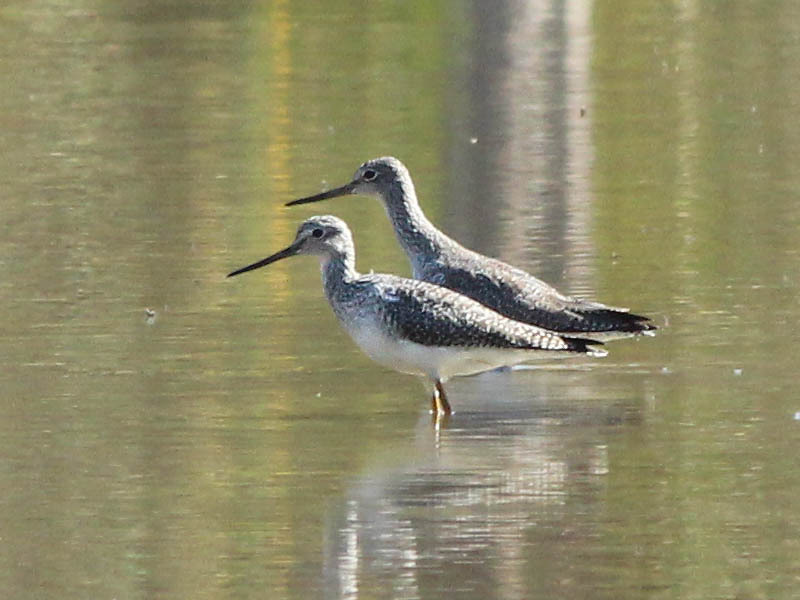 The male is distinguished from the female by the larger knob on his bill. Primping and preening. Birds spend much of their idle time engaged in this activity. 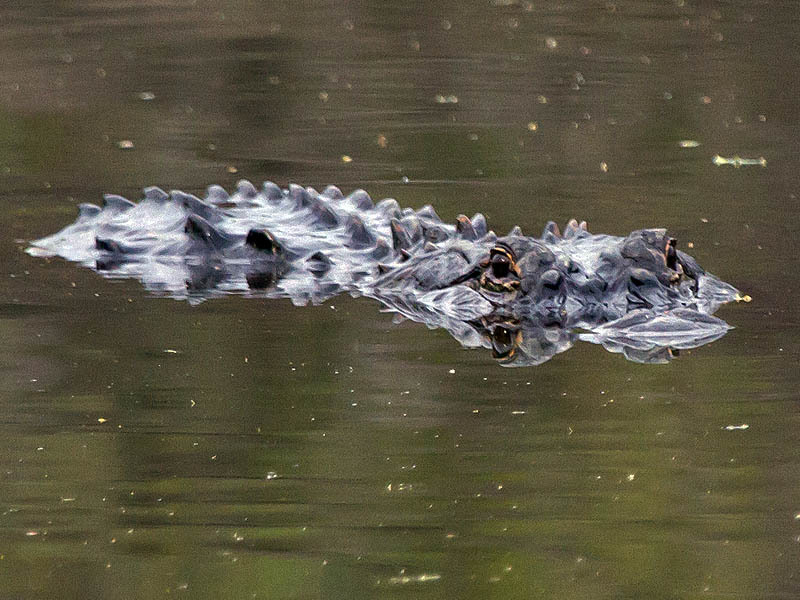 As always there was a variety of other urban wildlife activity at the park on the afternoon I visited. Right away I was greeted by two species of strikingly colored blue birds. 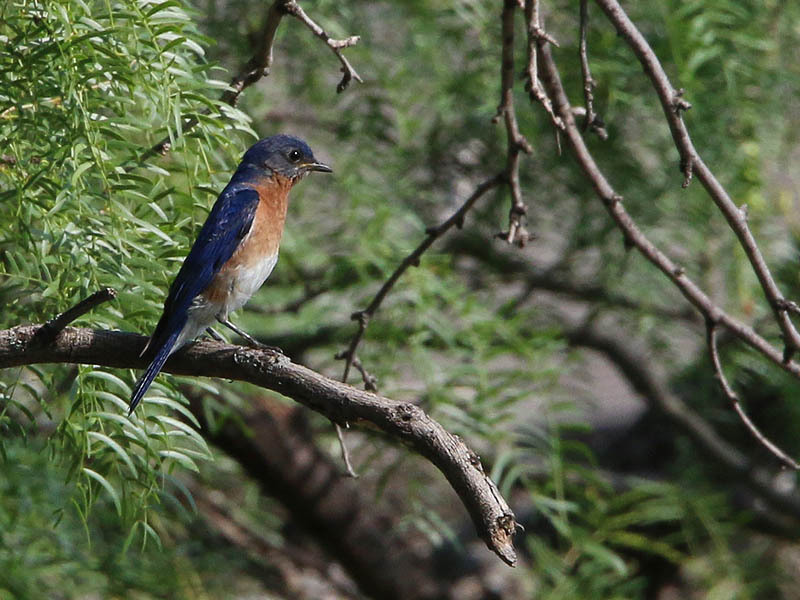 I spotted this male Eastern Bluebird as he flew from branch to branch in a group of Mesquite Trees. Both parents cooperate in raising the young, which they feed a diet consisting almost entirely of insects. Some young stay around the nest to help raise another brood. Fledglings are grayish in color with speckled breasts. The blue color becomes much more prominent and the speckles on their breasts disappear as they mature. 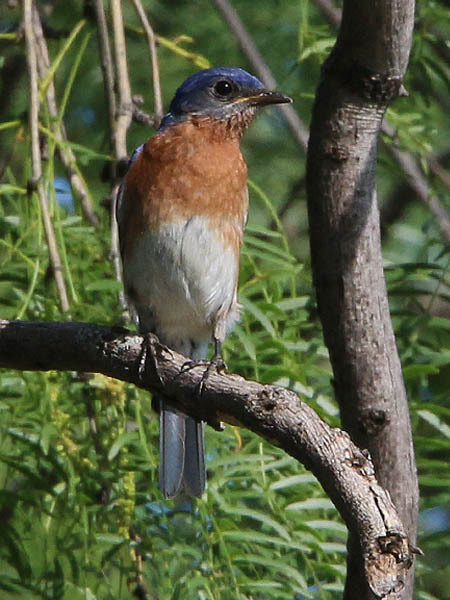 Bluebirds may begin breeding the summer after they are hatched. Another look at the Eastern Bluebird. Down near the creek I found this other intriguing blue bird—a mischievous Blue Jay making his way through the branches with a prized grasshopper clutched in his beak! 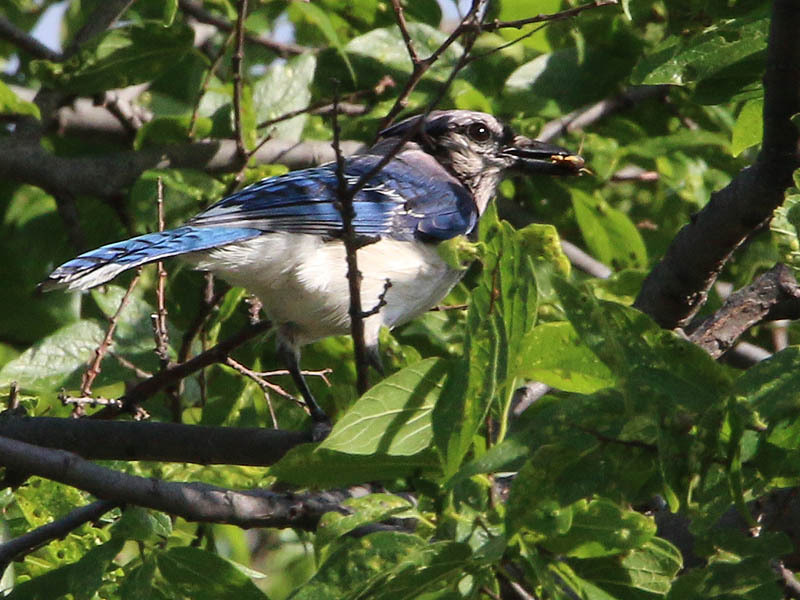 A Blue Jay carrying an grasshopper in it beak. 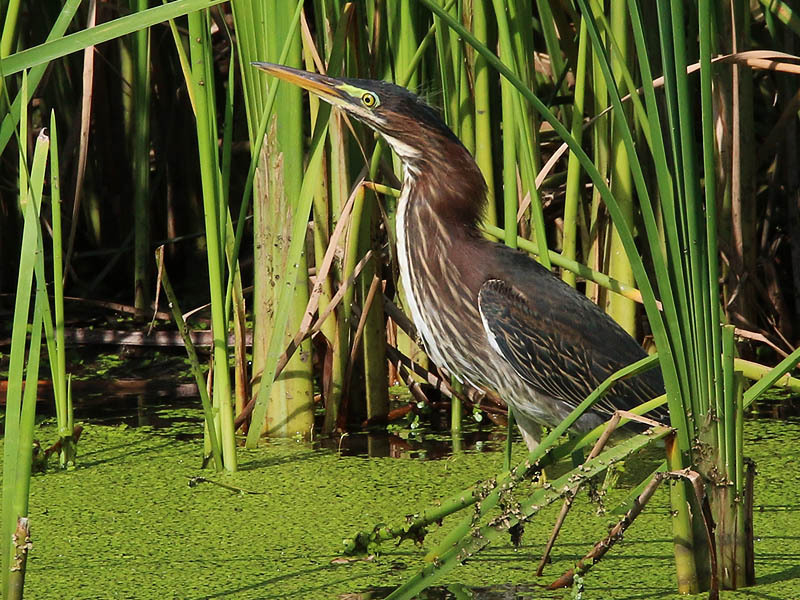 Birds of the heron family were out in force on this afternoon as well. Strong winds made for difficult flying conditions for some of the larger birds like the great Egret pictured below. Launching into a headwind created a moment or two where the big bird was virtually stationary in midair as he worked to build momentum.—a great picture taking opportunity! 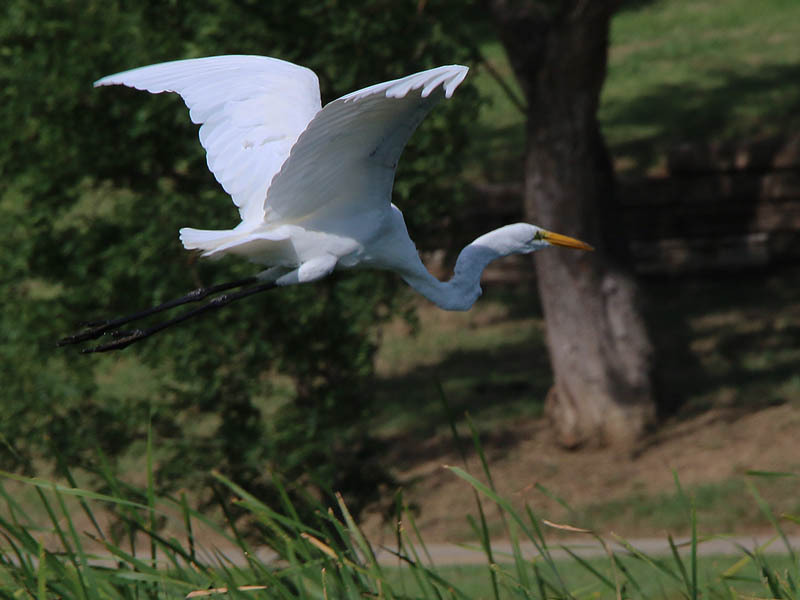 On windy days a large bird like this Great Egret can have difficulty becoming airborne. 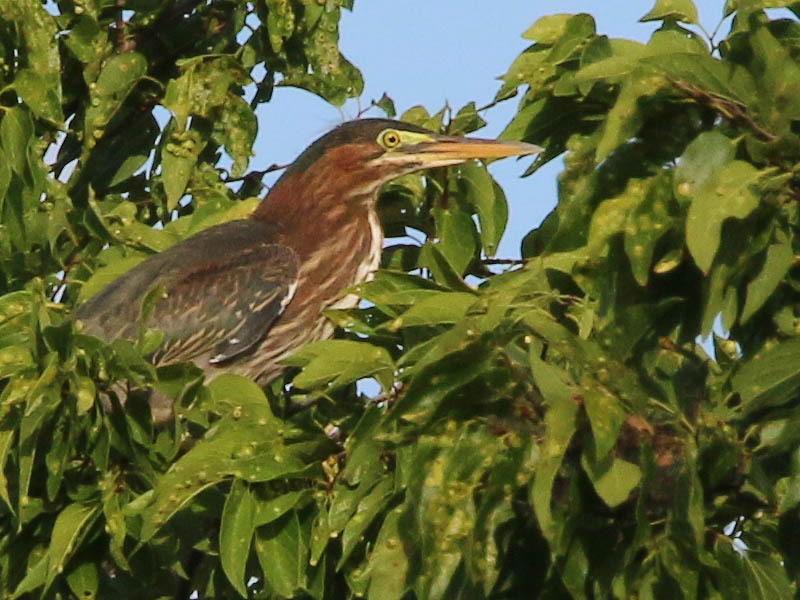 The fledgling Green Herons were still out and about this week. Their slightly awkward flying—and even more awkward landings—make them easy to spot as they move from place to place around the lake. 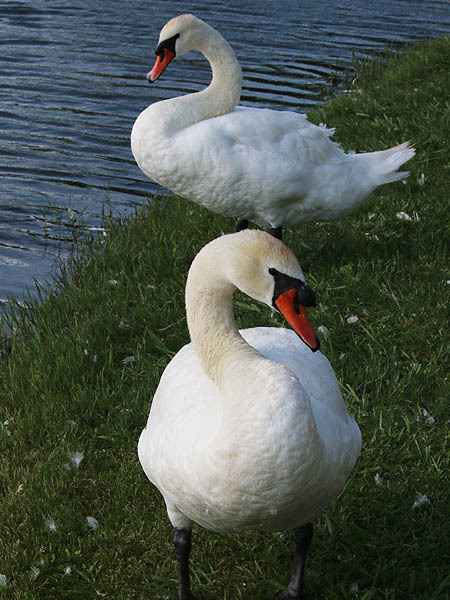 The three siblings still follow each other as they move about the park, but they do not remain in such close proximity any longer. Maturation requires that these young birds become independent of each other, as adults they will typically go about their business alone. The heron siblings still follow each other around, but they no longer stick together as closely as they once did. A Red Saddlebags. 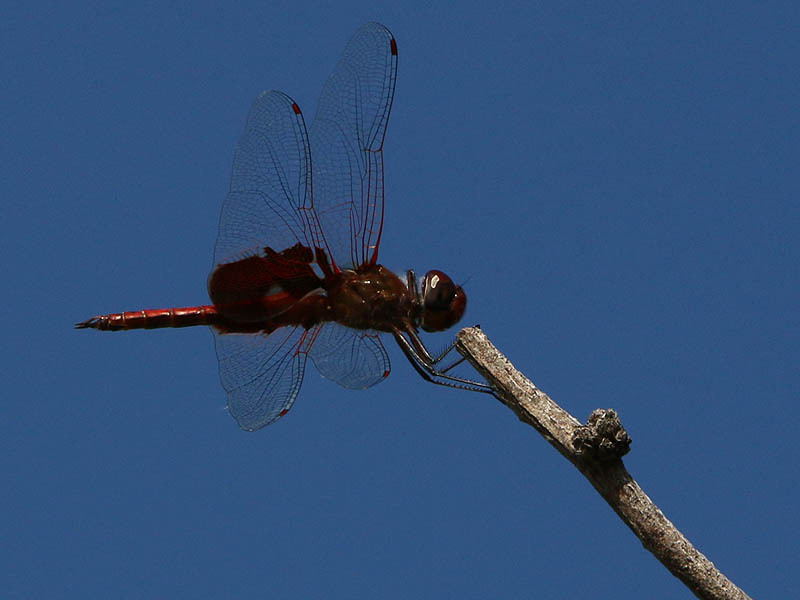 Notice how its front legs are being held in a folded position just behind the dragonfly’s head. Below you will find pictures of a Gizzard Shad spawning congregation. Hundreds of these fish would gather near the banks of the lake. There they would roil the water quite dramatically for several seconds before finally moving on. I observed multiple aggregations form up and then dissolve over the course of my visit. These are spawning Gizzard Shad. 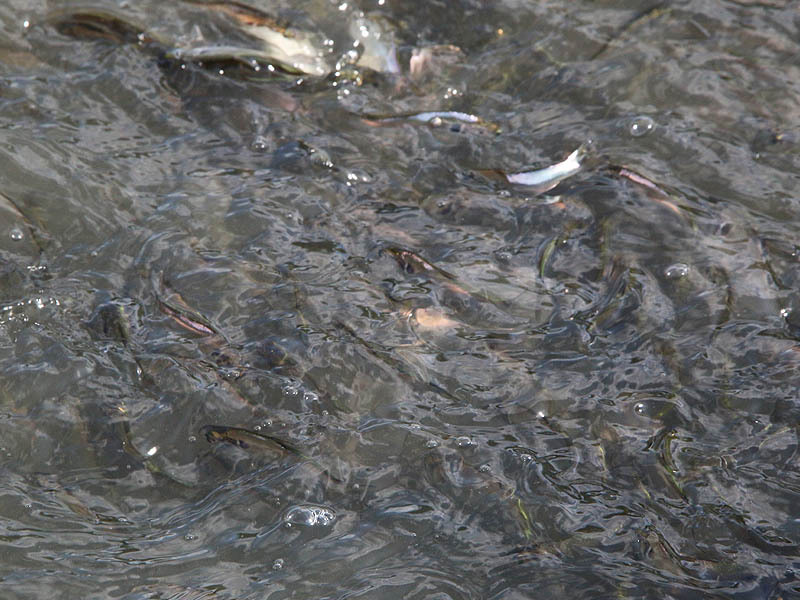 I found several of these large congregations of shad in the shallow water near the edge of the pond. The water was roiling with spawning activity. 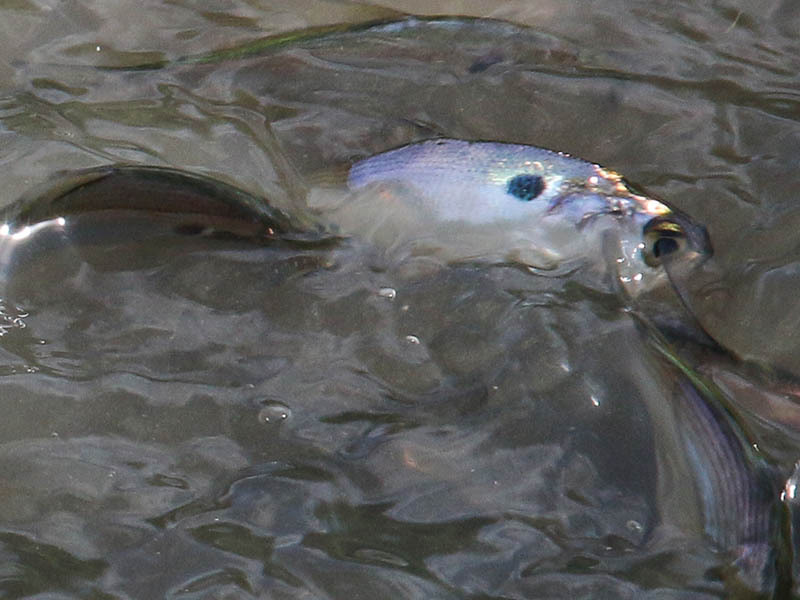 The blue-green dorsal region combined with a should spot larger than the pupil help to identify this fish as a Gizzard Shad. The American gizzard shad, Dorosoma cepedianum, is a fish of the herring family Clupeidae native to fresh and salt waters of eastern North America. Like other gizzard shads, the body is deep somewhat forward of the middle. 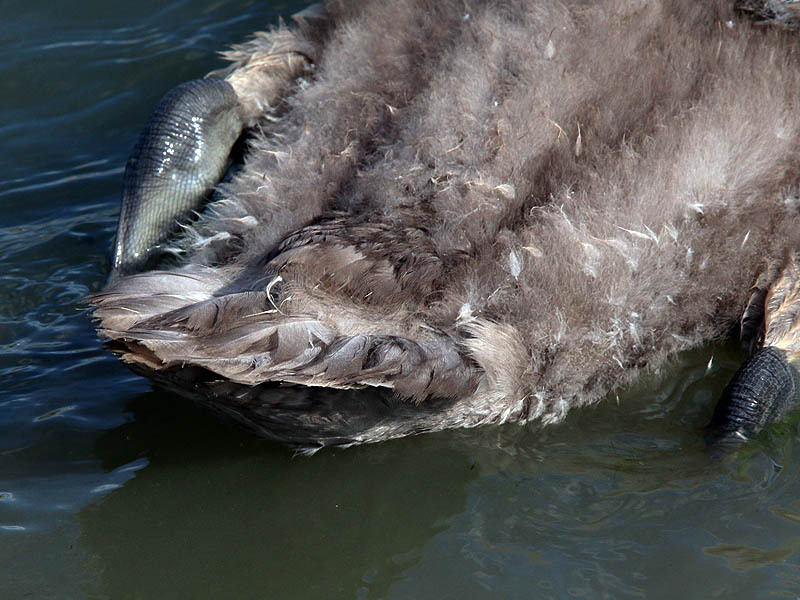 It is a grayish or silvery blue above, becoming silver on the sides and white below. The dorsal fin has 10-12 rays; in adults, the last ray is very long, extending beyond the rest of the fin. The caudal fin is deeply forked. They can reach a length of 22.5 inches (57 cm), and weigh up to 4.37 lbs (1980 grams). 15% of D. cepedianum breeds in its second year about 59,000 eggs, the rest about 379,000 in its third year. 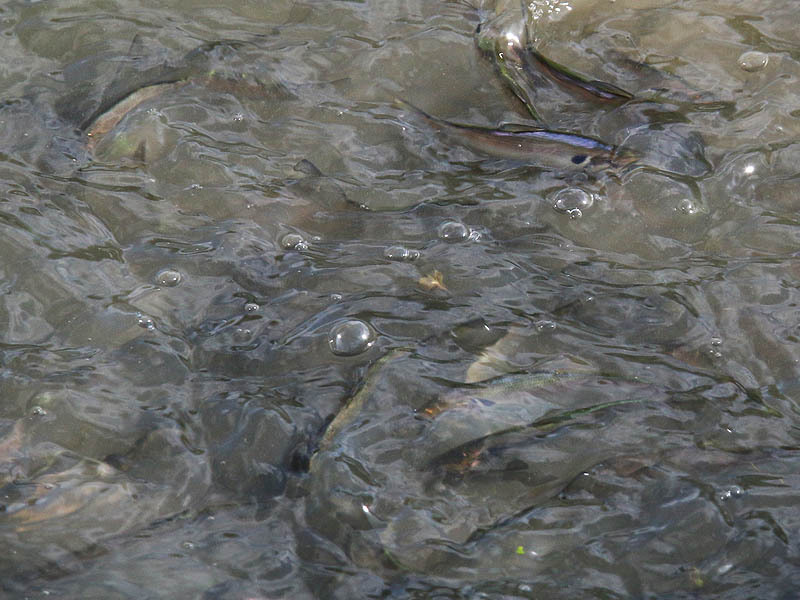 American gizzard shad begin life feeding on zooplankton, using their teeth to catch them. At about 1 inch in length, they lose the teeth, become deeper-bodied, develop the muscular gizzard, and become filter feeders, consuming both small invertebrates and phytoplankton, as well as some sand for the gizzard. They live in a variety of open waters, both clear and silty, including rivers, swamps, lakes, and bays, typically near the surface. They avoid fast-moving water, But have been witnessed in large schools near, and under, dams, warm water outlets, and turbine outflows. Most of the pond’s Mallard ducklings have grown to the point that is becoming difficult to tell from them from the adult birds. Still, some new ducklings are hatching out even at this late date. 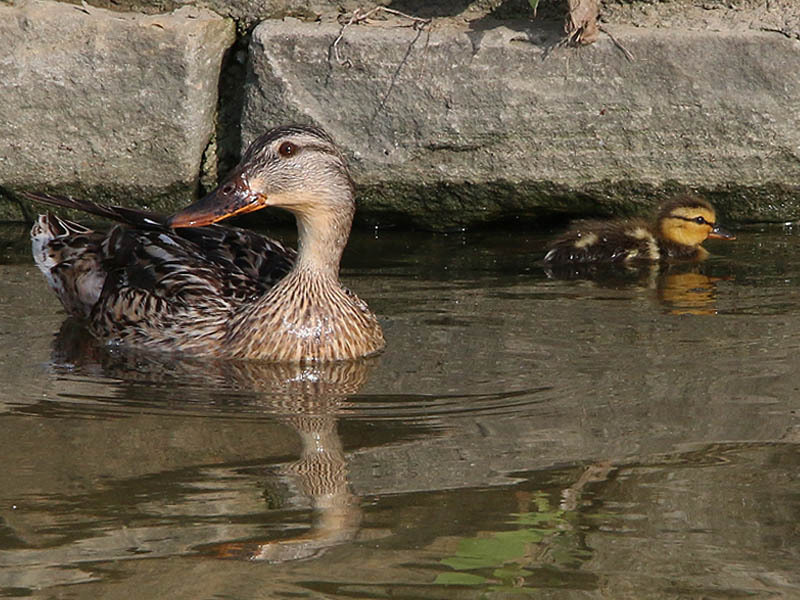 Below you will find a picture of fledgling Mallards swimming with some adult birds, and another photograph of a mother Mallard with a single, only days old, duckling. 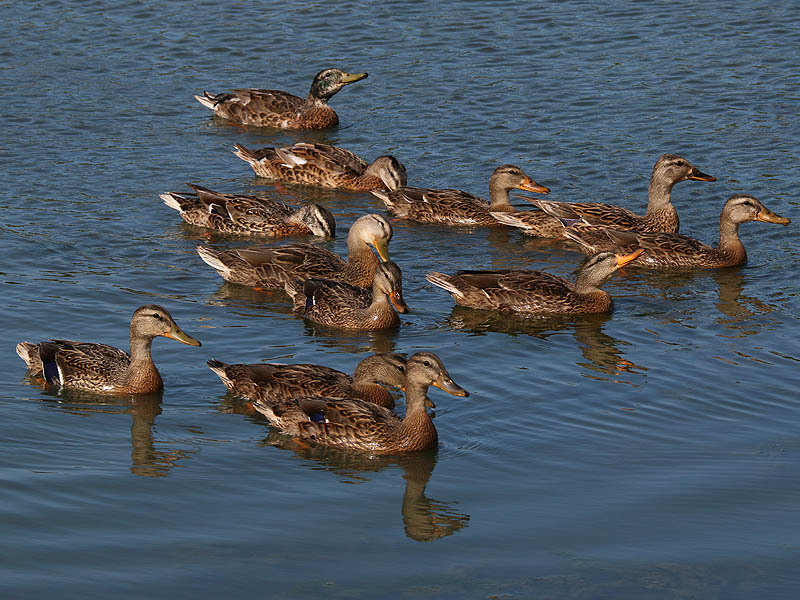 Mallards of various ages swimming together. A female mallard with a single tiny duckling. 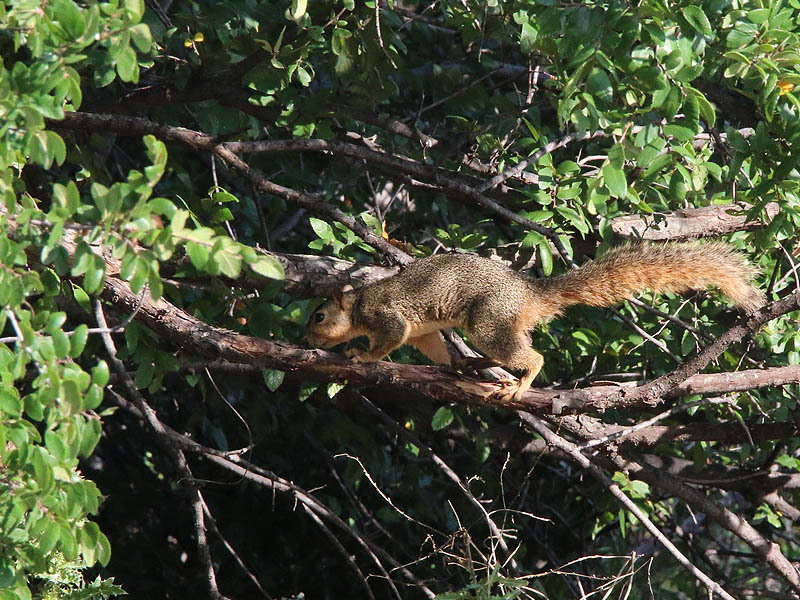 In addition to young birds, there were also many juvenile mammals busying about the park on this sunny afternoon. 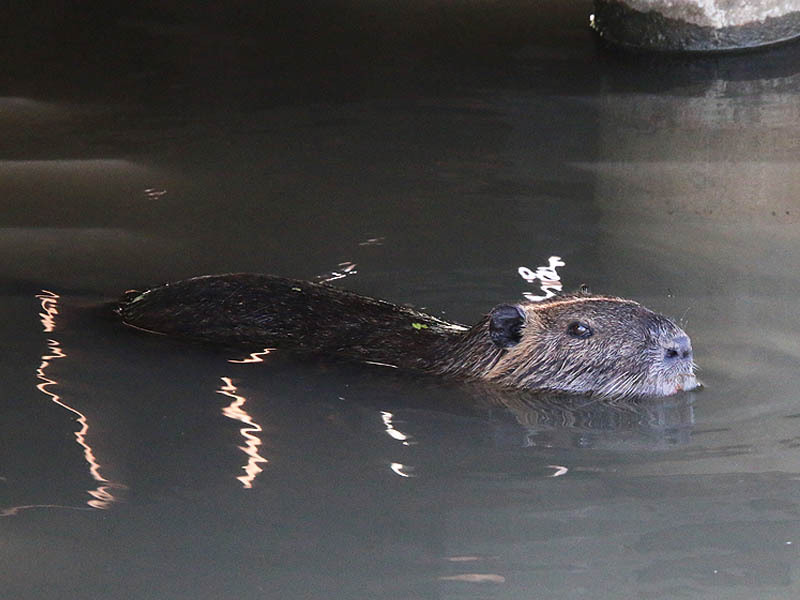 I was startled to notice a surreptitious young Nutria keeping an eye on me from under the boardwalk. 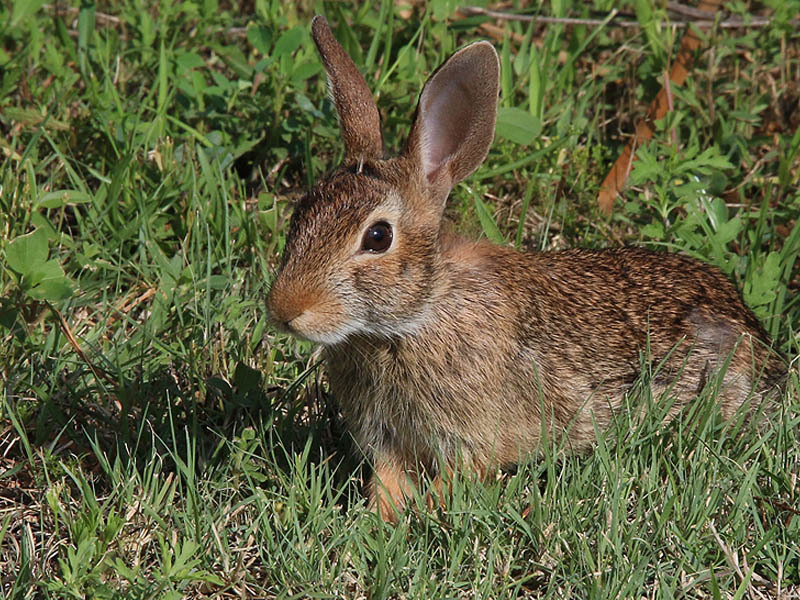 A charming Eastern Cottontail was feeding in the manicured grass nearby. 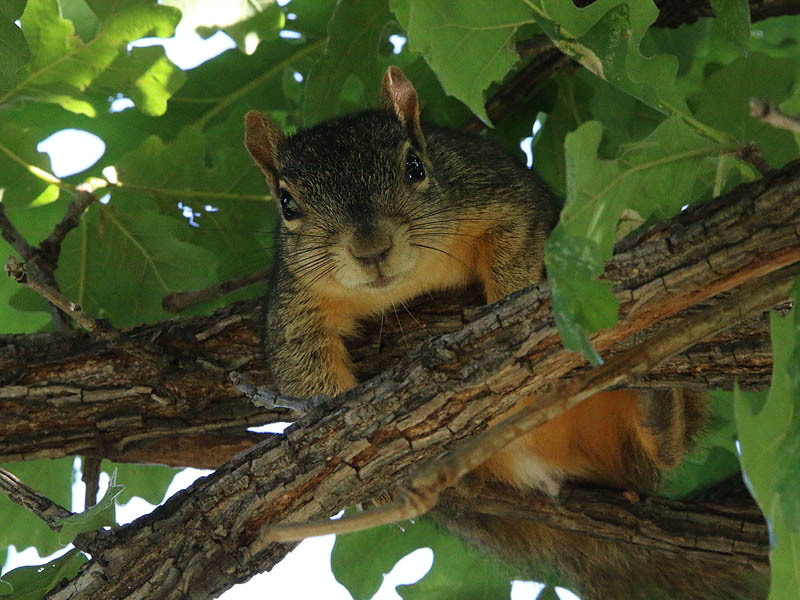 Fox squirrels are strictly diurnal, non-territorial, and spend more of their time on the ground than most other tree squirrels. They are still, however, agile climbers. They construct two types of homes called “dreys”, depending on the season. 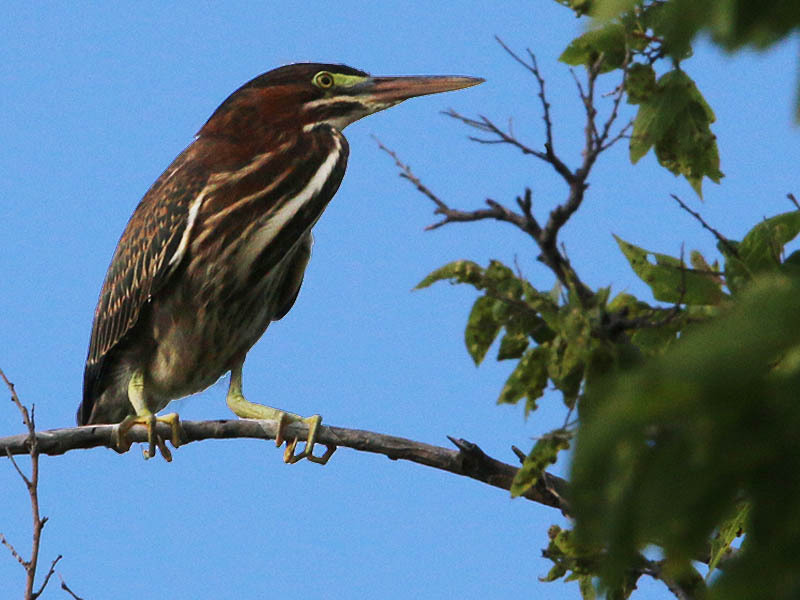 Summer dreys are often little more than platforms of sticks high in the branches of trees, while winter dens are usually hollowed out of tree trunks by a succession of occupants over as many as 30 years. Cohabitation of these dens is not uncommon, particularly among breeding pairs. 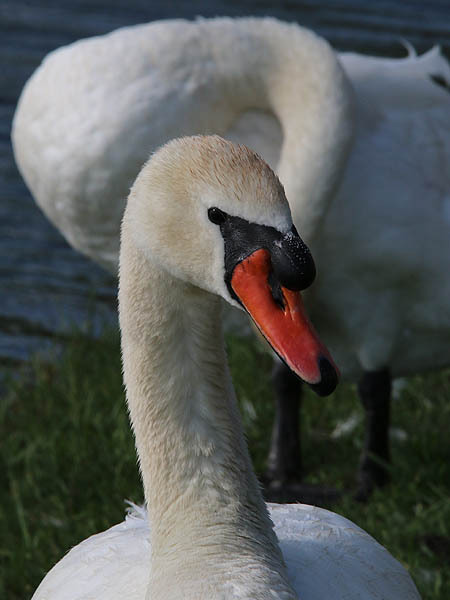 They are not particularly gregarious or playful, in fact they have been described as solitary and asocial creatures, coming together only in breeding season. 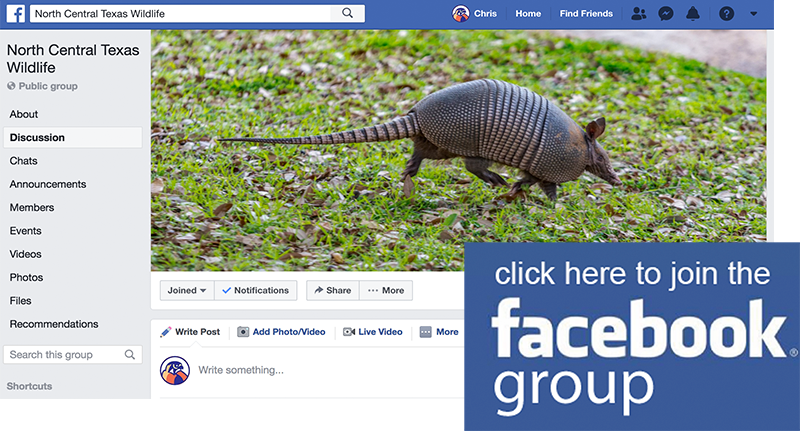 They have a large vocabulary, consisting most notably of an assortment of clucking and chucking sounds, not unlike some “game” birds, and they warn the listening world of approaching threats with distress screams. 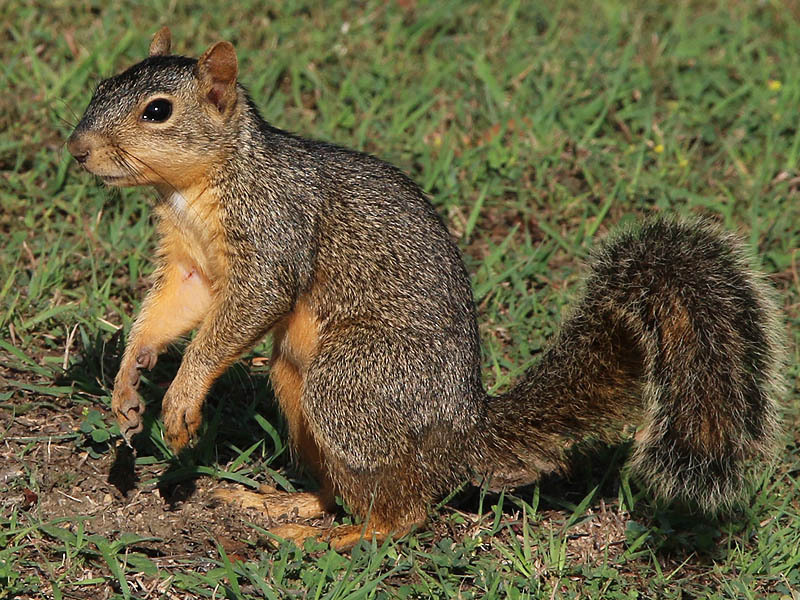 In the spring and fall, groups of fox squirrels clucking and chucking together can make a small ruckus. They also make high-pitched whines during mating. 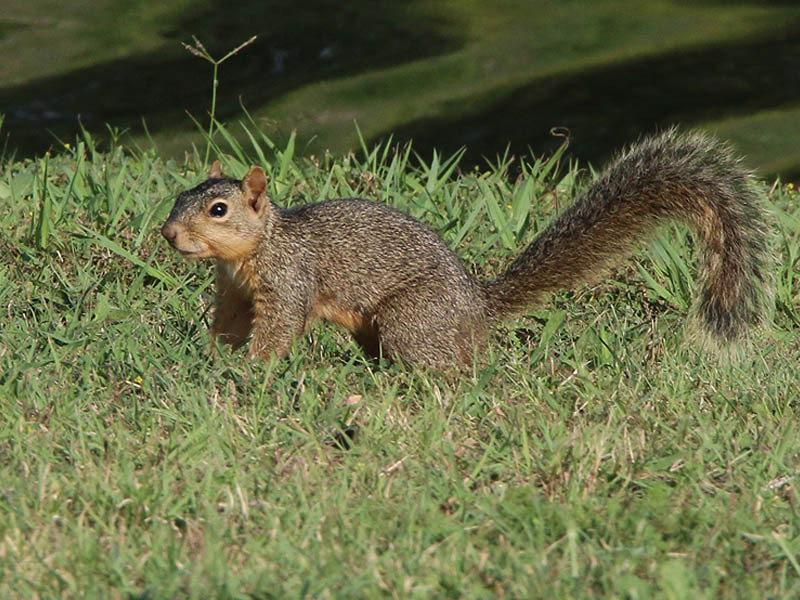 When threatening another fox squirrel, they will stand upright with their tail over their back and flick it. 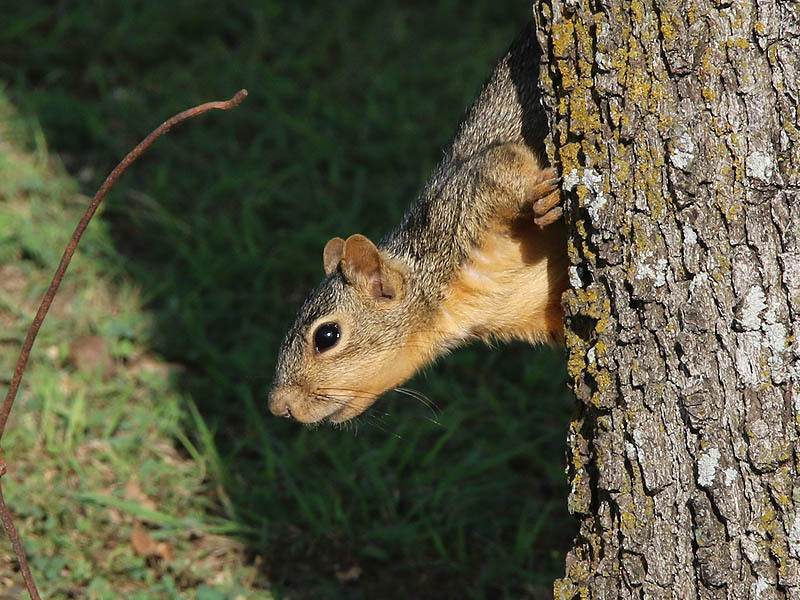 The very definition of bright-eyed and bushy-tailed! Keeping and eye on me from behind a tree trunk. Pigeons and doves constitute the bird clade Columbidae, that includes about 310 species. Pigeons are stout-bodied birds with short necks, and have short, slender bills with fleshy ceres. Doves feed on seeds, fruits, and plants. This family occurs worldwide, but the greatest variety is in the Indomalaya and Australasia ecozones. In general, the terms “dove” and “pigeon” are used somewhat interchangeably. Pigeon derives from the Latin pipio, for a “peeping” chick, while dove is a Germanic word that refers to the bird’s diving flight. 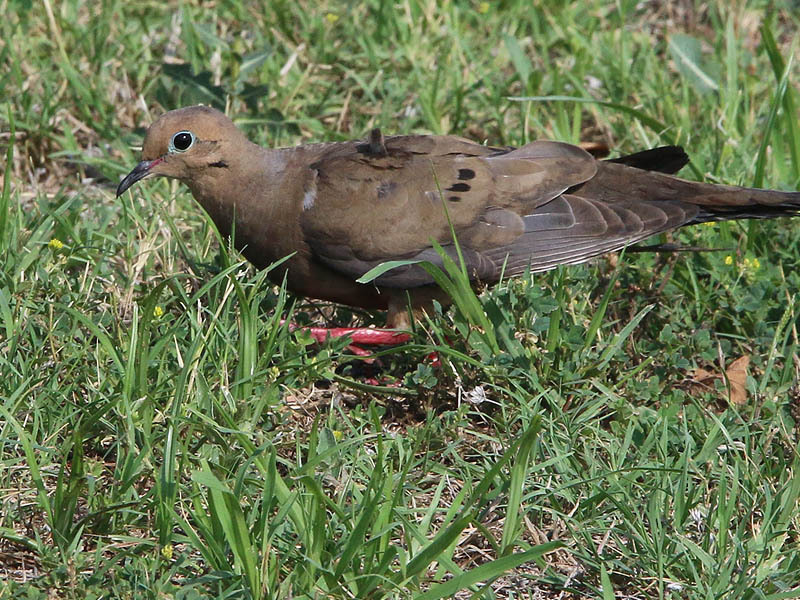 In ornithological practice, “dove” tends to be used for smaller species and “pigeon” for larger ones, but this is in no way consistently applied, and historically, the common names for these birds involve a great deal of variation between the terms. 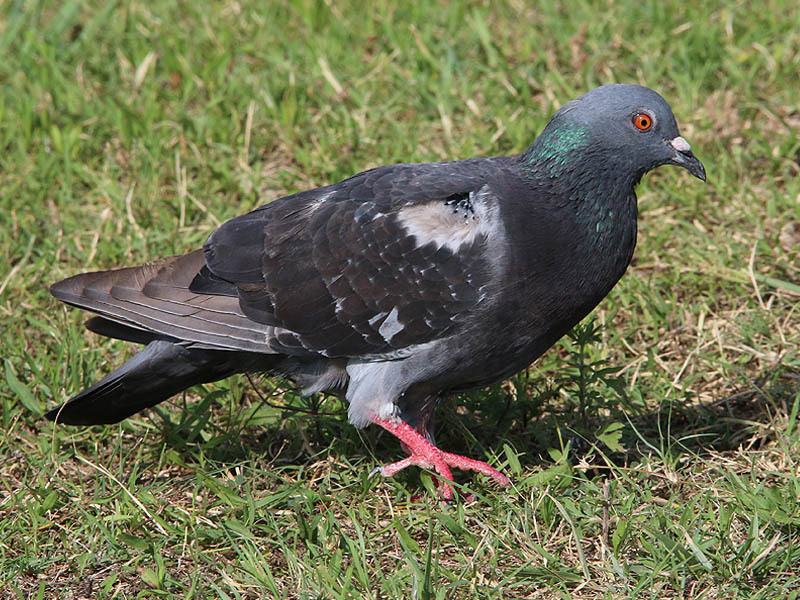 The species most commonly referred to as “pigeon” is the feral rock pigeon, common in many cities. 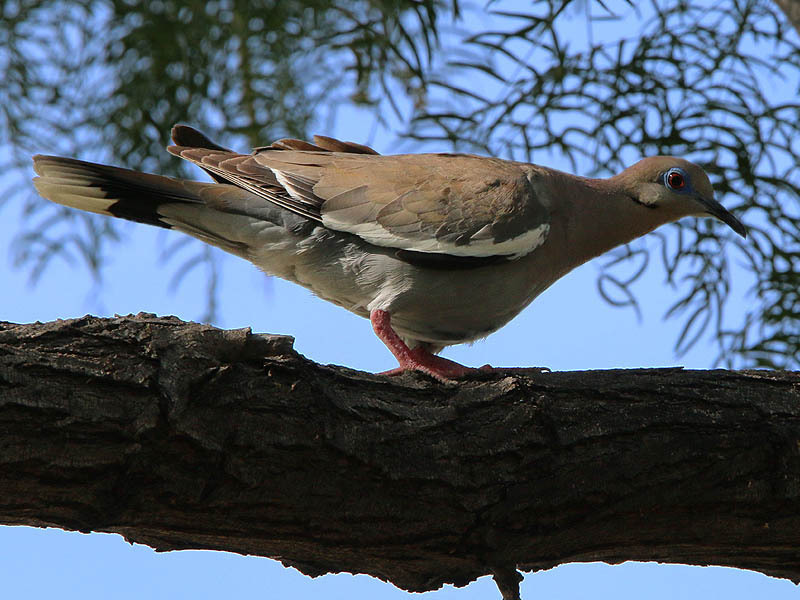 Doves and pigeons build relatively flimsy nests – often using sticks and other debris – which may be placed in trees, ledges, or, on the ground, depending on species. 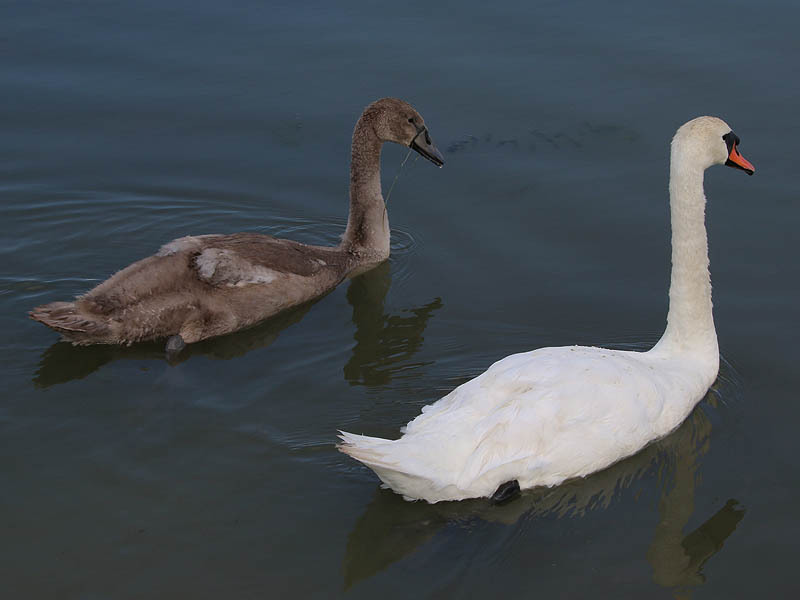 They lay one or two eggs, and both parents care for the young, which leave the nest after seven to 28 days. 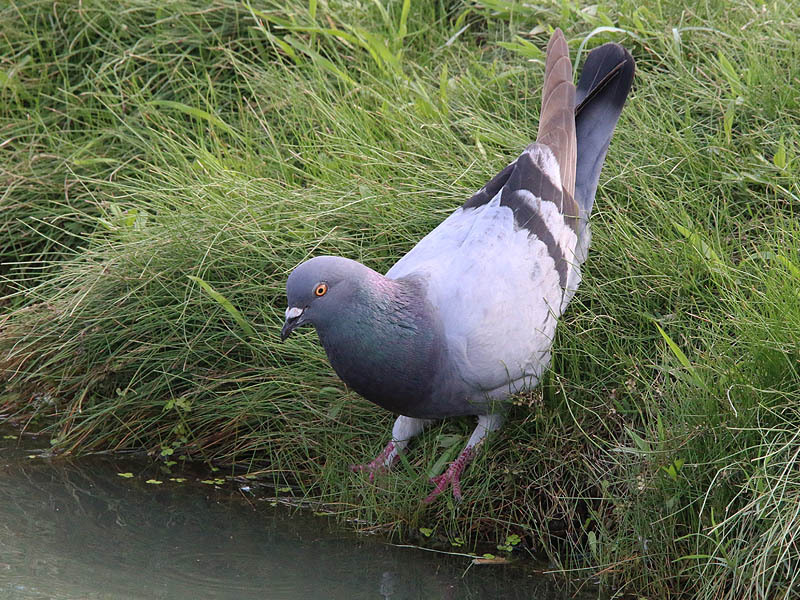 Unlike most birds, both sexes of doves and pigeons produce “crop milk” to feed to their young, secreted by a sloughing of fluid-filled cells from the lining of the crop. Young doves and pigeons are called “squabs”. 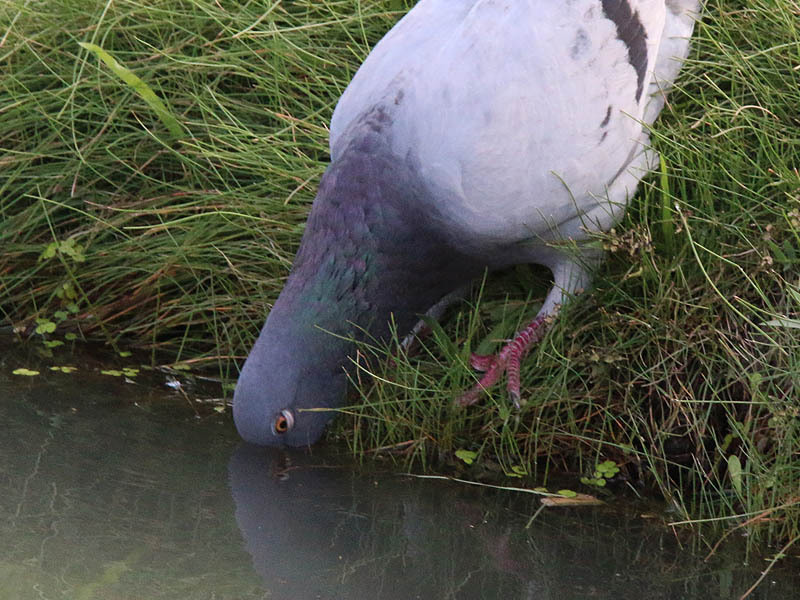 A Rock Dove preparing to take a drink. Drinking from the lake water. What may be the most interesting observation of the day follows below. 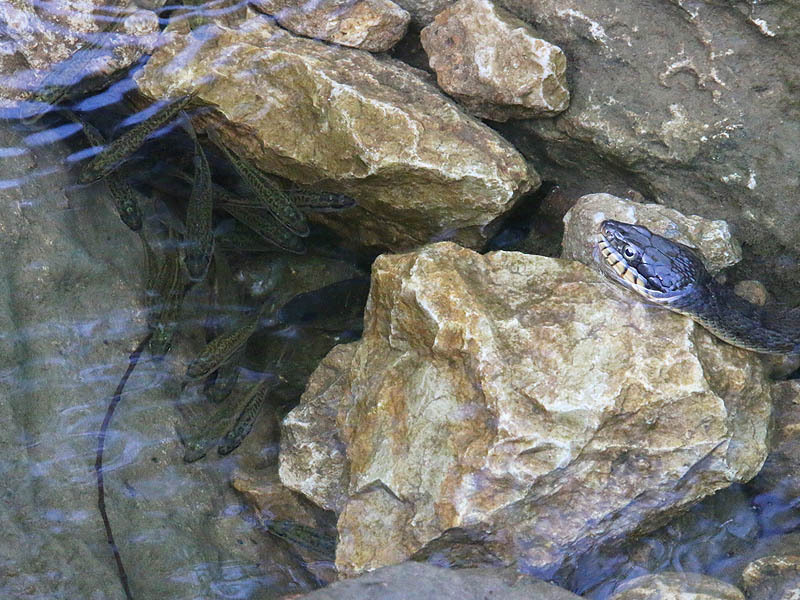 Recent rain showers overflowed the spillways of the park’s ponds and carried fish into the outflow creek. When the water receded it left many of these fish stranded in small standalone pools of water. 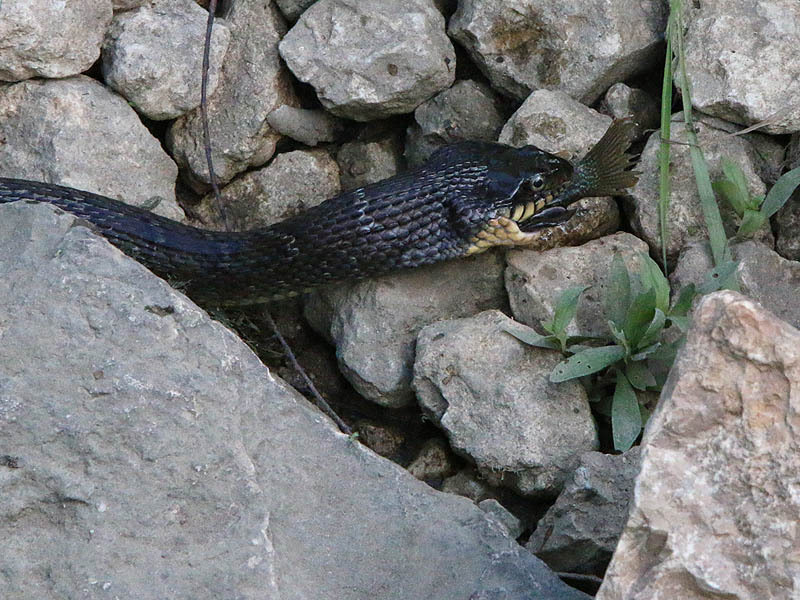 Resident snakes were quick to take advantage of this potential bounty. 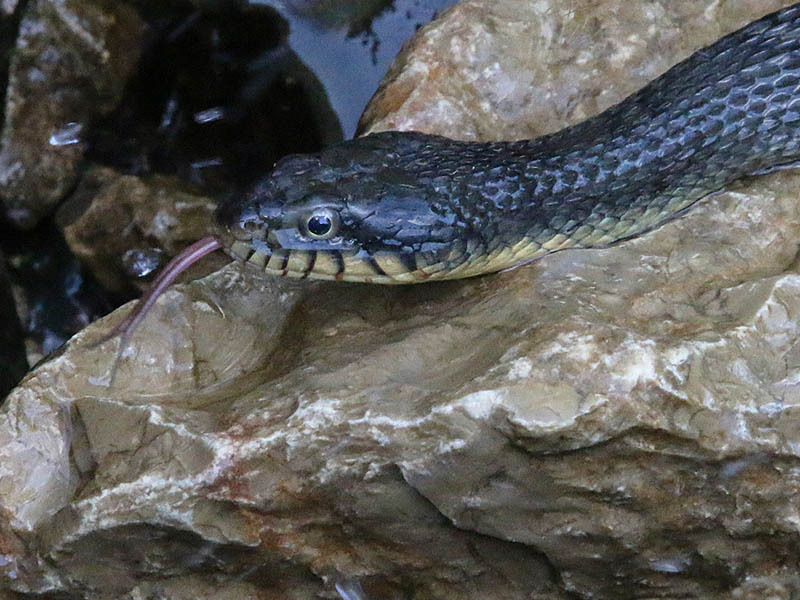 Below you will find pictures of several different species of snakes gathering around one of these small pool waiting for their chance to hunt the fish trapped within. A video of some of the hunting behavior is included at the very end. The old saying, “it will be just like shooting fish in a barrel,” naturally comes to mind when witnessing a situation like this one. 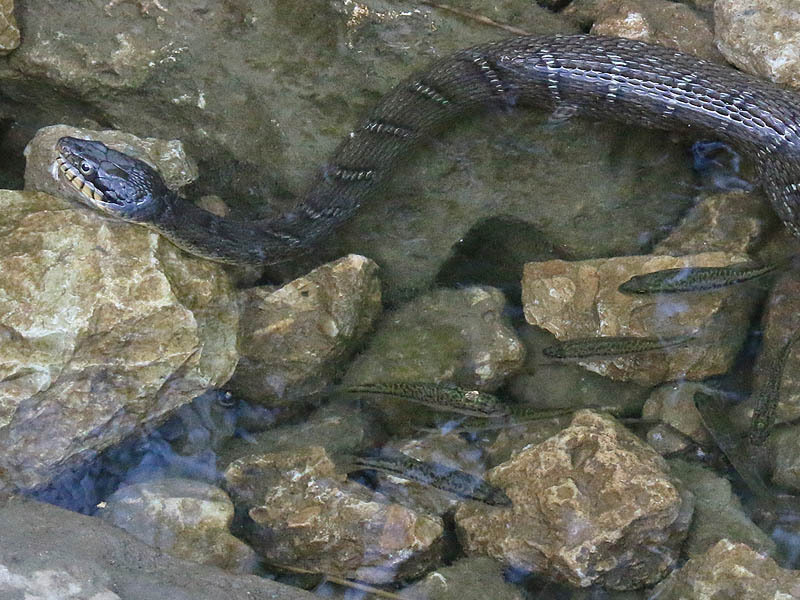 Two subspecies of the Plainbelly Water Snake are represented here—the Yellowbelly Water Snake and the Blotched Water Snake. 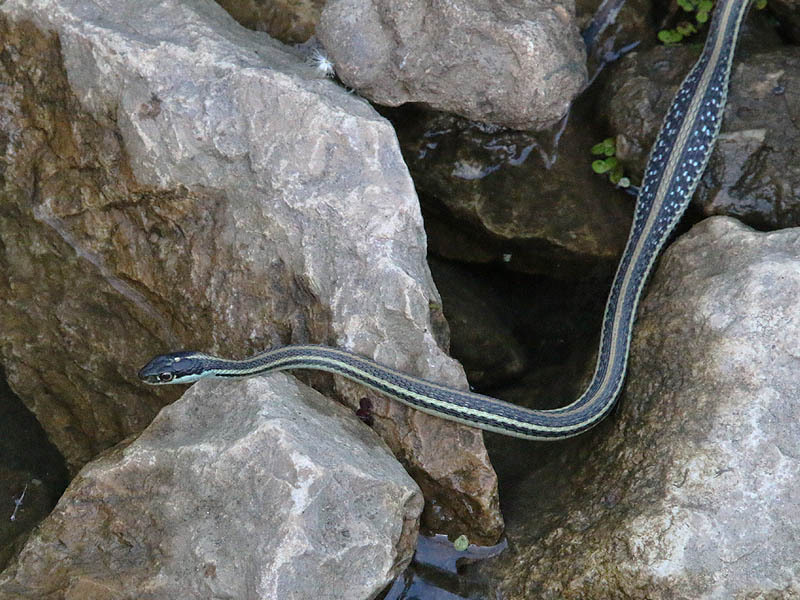 A Western Ribbon Snake made a brief appearance as well. All of these snakes are nonvenomous and are harmless to people. 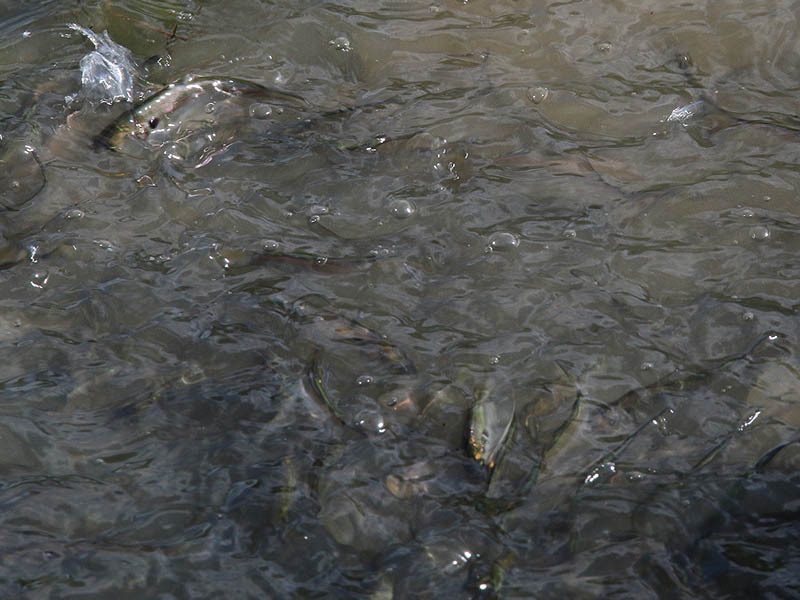 The fish they are feeding on appear to be sunfish and juveniles of some kind of game fish—possibly Largemouth Bass. 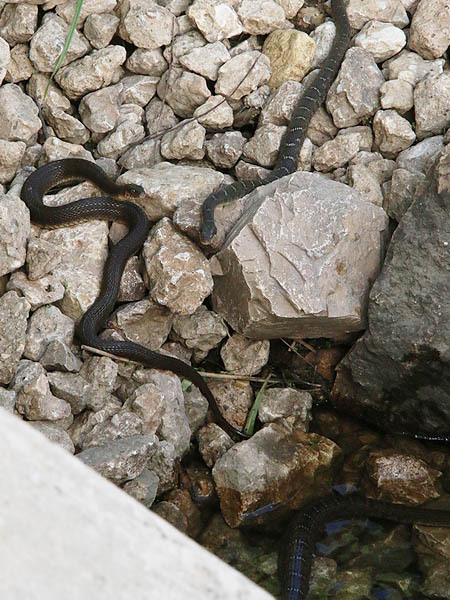 A Yellowbelly Water Snake (left), a Blotched Water Snake (top right), and a part of a larger Blotched Water Snake (lower right). 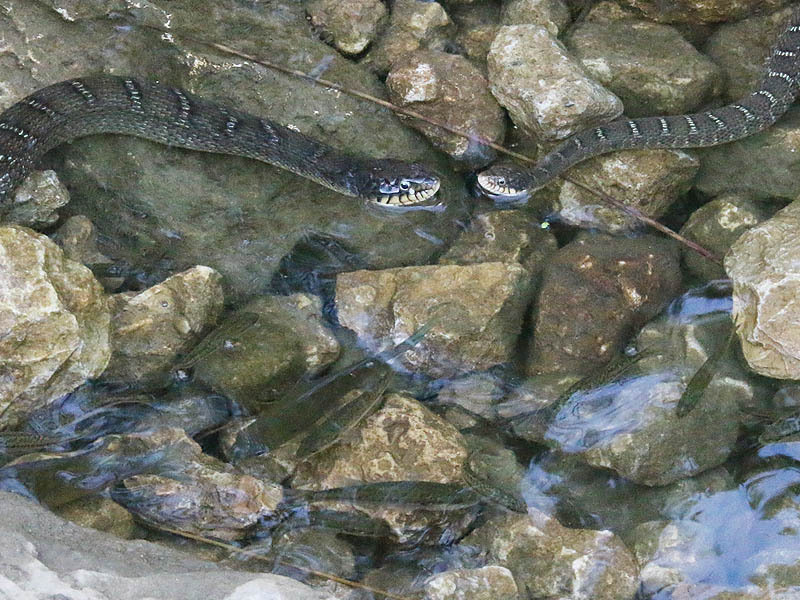 Two Blotched Water Snakes hunting in a small pool of water filled with stranded fish. A Western Ribbon Snake. Notice the bulge in its abdomen. 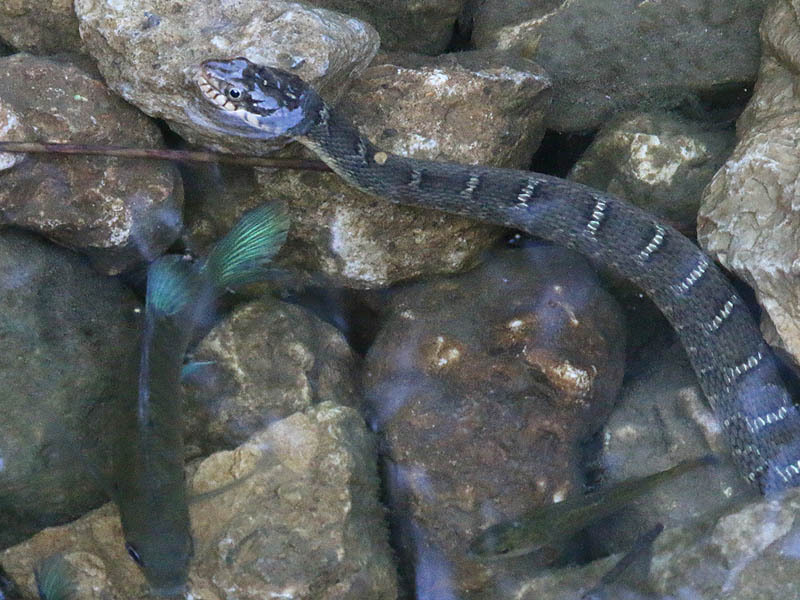 The fish in this pool proved to be an irresistible draw to snake in the area. These appear to be juvenile game fish—maybe Largemouth Bass. Leaving with a full belly.